Above, Vietnam veteran Dennis McLain puts on a pot of water in the kitchen of the Northland House, a new group home for homeless vets. At left, the common dining room in the home, the former rectory of St. Francis de Sales Church. Doug Mullenhoff was in need of help but didn’t have a place to go, until he met Stefani Kaganoff. The 59-year-old Vietnam veteran has diabetes and mild depression, and is scheduled for cancer surgery in Albany this week. The Buffalo native, who spent 40 years in the South, had lived near Batavia, but was having a difficult time with neighbors and needed a better home. 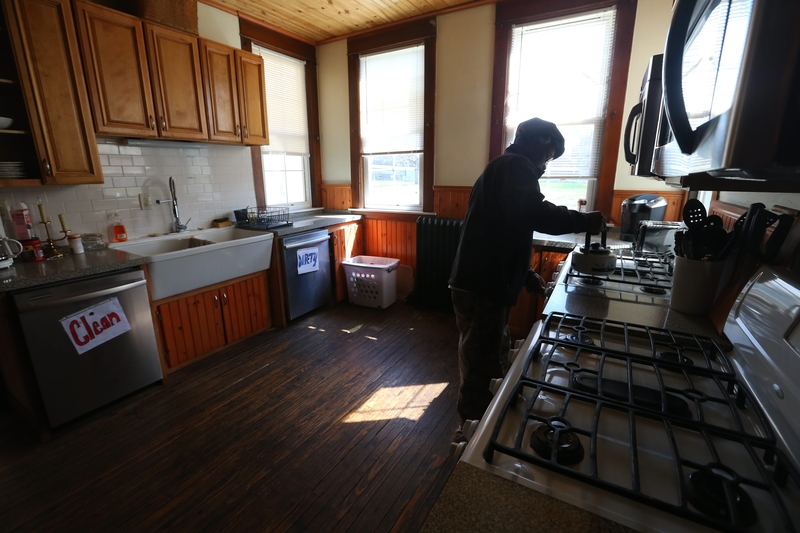 Through a Veterans Administration social worker, he found Kaganoff, who teamed up with her brother last June to start a new boardinghouse for homeless vets on Buffalo’s East Side. Now, Mullenhoff is one of seven residents – all military veterans – of a stately four-story stone mansion at 401 Northland Ave., owned by siblings Kaganoff and Danny Zyskind. The venture is designed to meet a need for veterans who can’t or won’t live independently and who don’t have families locally, but who also don’t need the constant medical care of a hospital or nursing home. And it’s been successful enough that the siblings are looking to open a second home in Ransomville, in Niagara County. “We’re looking to bridge the gap between those who can live on their own and those who need assisted living,” said Kaganoff, who grew up in the health care business because her father owns three assisted-living facilities. The Northland House, built in 1918 and formerly the rectory for the now-closed St. Francis de Sales Church next door, is one of several group homes for veterans in the area. They take residents on referral from the Buffalo Veterans Affairs Medical Center or other emergency rooms, or from the VA’s homeless program, the Veterans One-stop Center of Western New York, the Buffalo City Mission, or social services agencies like Compeer. Officials estimate that 1,500 to 2,000 veterans are homeless or at risk of homelessness in Western New York. “Northland House is a valued community resource,” said Alex Lauer, community relations manager at the One-stop Center. Residents are still part of the VA system, which provides them with medical care and counseling, as well as various government benefits, including pensions and even short-term rent through the One-stop Center. But unlike the other facilities, the Northland home is not VA-certified or contracted, so it has no curfew and no limit on the duration of someone’s stay, and no requirement to sign in every day. Some vets have stayed for weeks, while others have remained for as long as seven or eight months. Many veterans suffer from post-traumatic stress disorder or other mental health issues, and can’t or won’t live alone until they’re more stable. Some also have substance-abuse problems. Sometimes, the staff at the VA hospital simply “run out of ideas of what to do with someone,” Kaganoff said. The vets share a large kitchen and dining room, bathrooms, laundry machines and a basement den with two antique couches, a stone fireplace and a well-kept vinyl wood-grained floor. The 11 rooms in the house – five each on the first and second floors, plus the attic level – are fully furnished, including linens. Rent is determined by Kaganoff and Zyskind based on income, with a maximum of $850 per month. But if a veteran can’t afford it, they will work with the One-stop Center at 1280 Main St. to help the veteran get state or federal assistance, including from the Supportive Services for Veterans and their Families program, as well as from Social Security. “We help them apply for benefits, but it takes a while,” Kaganoff said. Kaganoff said she and her brother had identified the gap in services while working with veterans at assisted living centers owned by their father, and decided to try something new. When her brother found the former rectory, which already was being used as a rooming house by the former owner, they bought it “as is” for $300,000. “It’s very rare to find a house like this. That’s why we jumped on it,” she said.